Out of all of my Olympic countries, I think Kazakhstan did best at the London 2012 Summer Olympics, gathering a haul of seven golds, one silver and five bronze medals. Looking at the disciplines they got them in, I wouldn't ever want to mess with a Kazakhstani - they seem to excel at Weightlifting, Boxing and Wrestling (with a gold in Cycling and another in Athletics for a little diversity). They've fielded seven competitors in three different disciplines at the 2012 Paralympics - some have already sadly not advanced, but they still have some hope left in certain categories. Moving on to the food angle, their cuisine revolves heavily around horse meat and mutton. Of course, eating horses is (thankfully) frowned on in the UK so I didn't have to go down that route. According to the Beeb, the Kazakhstani team even tried to bring their own horse meat sausages with them as they believe that their protein rich diet is key to being amazing in the Powerlifting arena. I couldn't find out whether or not the UK Borders Agency permitted to bring them in but based on their prowess from the stats above, either they did or maybe they'd have medalled (I hate myself for using that term!) even more than they did. One of their most well-known dishes is Manti - or lamb dumplings. Having already done the dumpling thin "in Nepal" a few weeks back and being tight on time, I went for a different, pudding based dish. Chrov Plav. I can't for the life of me remember how I happened across this particular recipe as most of my research turned up recipes in how to preserve mutton and lamb - very important to the Kazakhstanis due to their historical nomadic lifestyles. The ingredients for Chrov Plav reflect this with a heavy reliance on dried fruits and rice - all of which would transport pretty easily without spoiling. Sadly, I'm not a fan of Chrov Plav. I think it's because I probably wanted it to be like an English rice pudding - creamy and comforting. The lack of full fat milk and/or cream and lashings of sugar probably makes this really good for you. It is sweet, but the sweetness comes from the dried fruit and honey - I don't really like honey. If for some bizarre reason I did try making this again, I'd probably throw some cardamom pods in to give it an additional flavour dimension. I'd also think about swapping the honey for maple syrup and while I was at it, substitute the water for milk. At which point it would be nothing like the Kazakhstan dish - and I'd probably just be better off making the Stovetop Coconut Rice Pudding I was so enamoured with earlier this year (ie a totally different dish). If you want to make it, here's the original recipe. 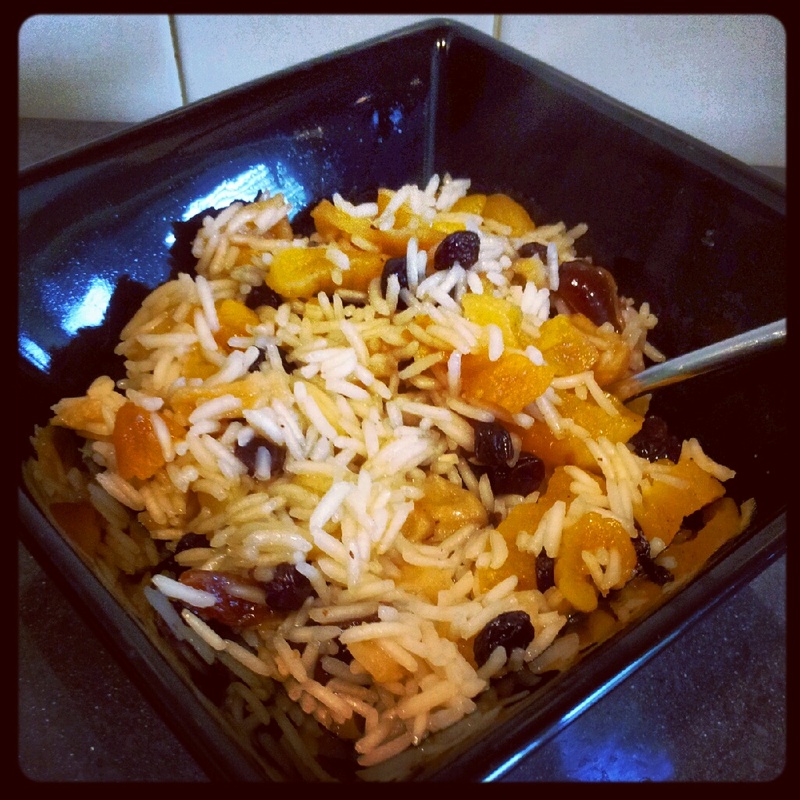 1/4 cup Apricots, dried, pitted & cut into strips ¼"x1"
Soak, dates, currants, & prunes in a bowl of warm water for 15 minutes. Then remove them, pat dry, and mix with the other dried fruits. Melt the butter in a large, heavy skillet over high heat. Add the fruit mixture and the almonds. Reduce the heat to low and stir for 4 minutes, stir in the honey, rice, and water. Raise heat to high and bring to a boil. Reduce heat to low, cover and simmer for 25 minutes.